There are four major warning signs that indicate your Toronto foundation is in need of repairs. If you know how to identify the early warning signs you could save thousands of dollars and countless headaches. It’s not unheard of for an entire room to cave in due to a faulty foundation, in even worse situations an entire house could crumble inwards. Your home’s foundation is incredibly important, as it supports the entire structure, keeping you, your family and all of your possessions safe. That’s why it’s so important to catch foundation issues early on. If you have any questions or want your Toronto foundation inspected, Turnbull Masonry is here for you. There are 4 key warning signs that indicate an issue with your home’s foundation. Your house will naturally settle with time, so little uneven areas here and there are not too much to fret over. On the other hand, if you notice any of these 4 things, you’ve got a bigger issue that needs to be addressed by a professional. 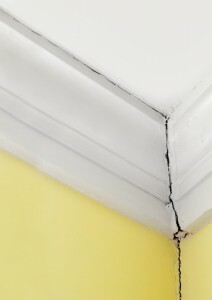 You notice cracks forming along the walls, especially near doorways, windows or right where the wall and ceiling meet up. Your windows suddenly start to stick, not opening and closing with the same ease as usual. You notice cracks forming along vinyl or ceramic tile over concrete flooring. Door(s) start to fail, jamming or refusing to latch. Water stains on your roof may be an indicator that you have a leak, which could allow water in all the way down to your foundation. Water rapidly deteriorates concrete, wood, drywall and other important structural components of your home. If your floors appear to be heaving, sagging or abnormally slopped. Check exterior brickwork for signs of sagging as well, as this too may indicate foundation instability. How Weak Is Your Concrete? Does your home have a poured perimeter foundation? If so, take a regular old screwdriver and head outside to an area where the concrete is chipping away. Poke at an area of concrete with your screwdriver. You shouldn’t be able to make a dent in the actual concrete. If the concrete breaks off easily under the pressure of the screwdriver your concrete foundation is actively deteriorating. This is common in homes built in the early 1900s, which were commonly manufactured with concrete foundations containing dirty or salty sand, or too much moisture. Unfortunately, in this instance the only cure is a new foundation. You can also check on your foundation by going in the basement or crawl spaces. Here you will find posts and other concrete supports that work in partnership with your foundation system. These posts should stand completely upright and appear firmly planted beneath the beams they support, as well as firmly planted on concrete piers. Check for any puddles or signs of wet wood; use a screwdriver to poke at wood posts to check for water damage or rot. If there are puddles in the basement or crawl space this is often indicative of poor drainage near the outsides of your home. Check all gutters on your home to make sure they are not plugged or broken. Also, soil should slope down away from your home at a rate of 6 inches per 10 horizontal feet. Are All Cracks A Cause For Concern? Just because concrete has a few cracks doesn’t mean there’s anything wrong with your foundation. Concrete will naturally incur a few cracks, as during the drying process it shrinks a bit. If the concrete is unable to shrink evenly, which can occur for a number of reasons, it will crack. Different cracks signify different levels of damage. L-Shaped Cracks: If cracks appear at an L-Shape section, for instance where the foundation moves down due to a hill, you are probably looking at harmless shrinkage cracks. They may need to be filled in but shouldn’t create any structural damages. Cracks In Stairs: This is a big deal if the cracks are larger than ¼ inch in width or you notice adjoining walls bulging out. In many cases this relates to drainage issues creating exterior pressure on a certain portion of the wall. Horizontal Cracks: These tend to be the most serious signs of foundation issues, and often equate to the need for an entirely new foundation. Horizontal cracks may be caused by the expansion of overly moist soil pushing against the foundation. If you have any doubts about the strength of your foundation your best bet is to take care of it as quickly as possible. Contact Turnbull Masonry for superior Toronto foundation inspections and repairs!